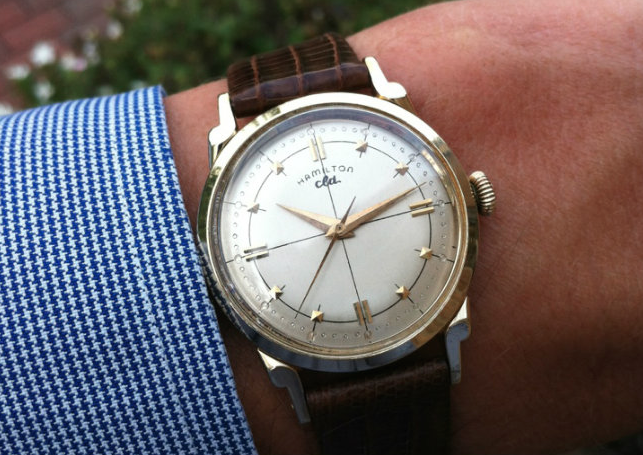 One of the first CLD watches in a solid gold case, the 1953 Reardon CLD was produced for two years. Being part of the CLD (sealed) line, the Reardon incorporates a series of gaskets around the crystal, bezel and crown to protect the inside from elements of the outside. It's not waterproof but it was better than other conventional sealing methods. 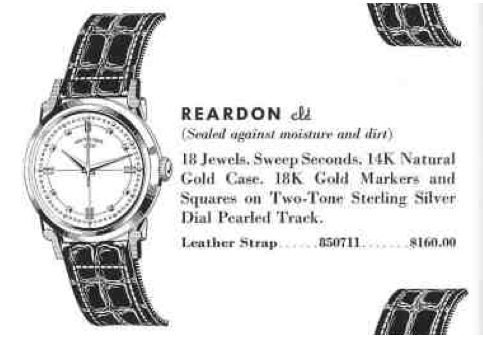 Like the Rodney, the Readon has a "pearlized dial" with little dots to represent the minute marks. These dials are very tricky to refinish so getting an example with a nice dial is the real trick to this model. The watch featured the 18 jewel, 8/0 sized 748 movement with a sweep second hand. The case is solid 14K gold and the sterling silver dial also has 18K gold markers. It's a nice, medium sized watch and looks great on the wrist. Hi I was was just tinkering and was wondering how to remove the stem/crown from this watch I know it is a two part stem and I am not sure if I should pull the crown straight out or line the joint up and have the movement fall out. You have to line the joint up and lift the movement up and away. First remove the bezel. The lift off the reflector ring. At that point you should be able to see the joint. You cannot pull the two sides apart without breaking the female side - so don’t try it. Do you see the stem? Pull the crown out to the setting position. Maybe it’s blocked by the dial. It’s definitely there. Look at the Kingdon post, it has more pictures. The joint is very close to the movement so if the dial overhangs the movement you’ll need to peek under it.